Hi Folks!! DeeDee here today sharing with you the outcome of our most recent swap... Halloween Themed Altoid Tins!! And the INSIDE! 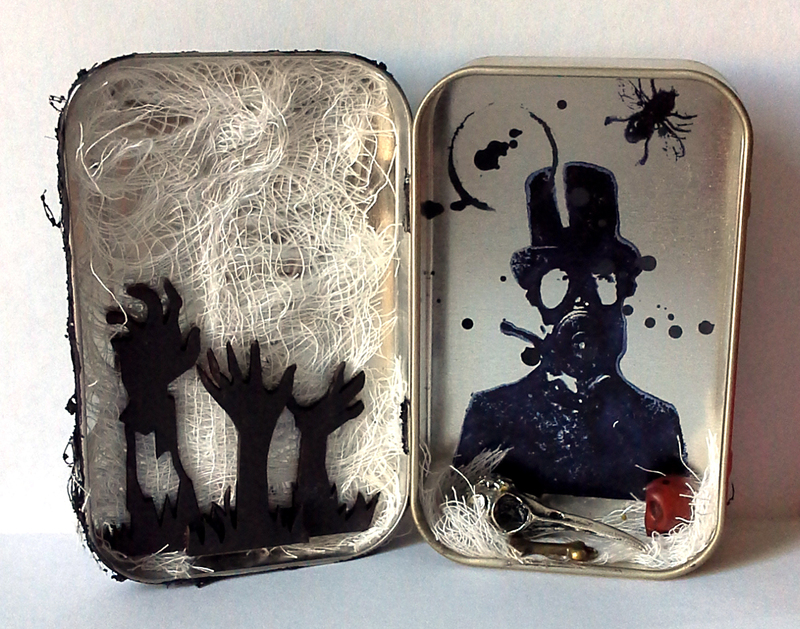 Anne used Be Afraid, Halloween Tree Silhouette, Frightful Fun and Folly, Sugar of Lead and Hear, Speak, See no evil. The talented artist behind this piece is one Christina Anderson! Flip the Devilish Face around and reveal a Ruffled Collar Clown! 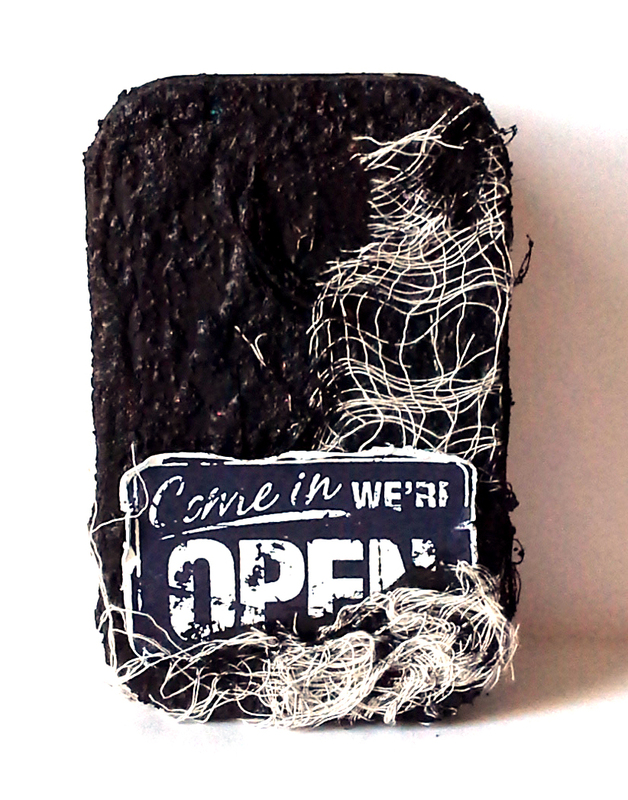 I used Fly, Man in Gash Mask and Open Sign. This beauty is by Eileen Wood! 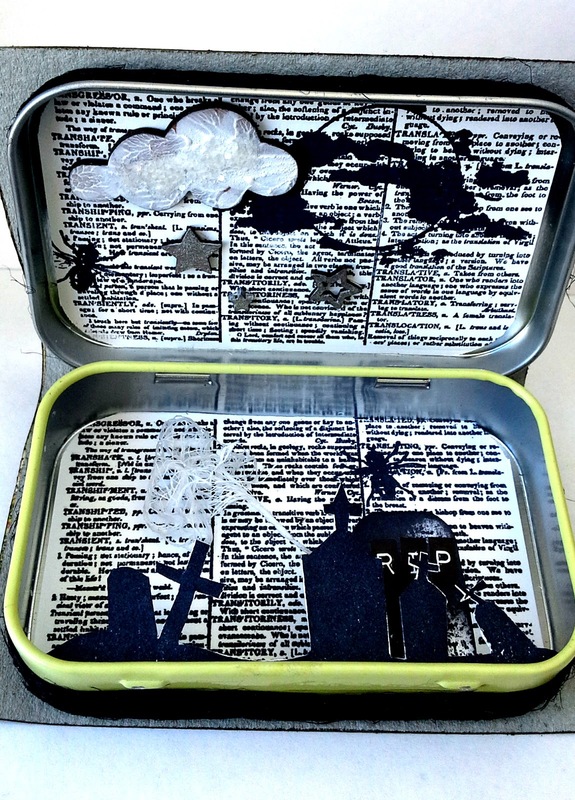 She used the 31, Nevermore and Full Moon stamps. 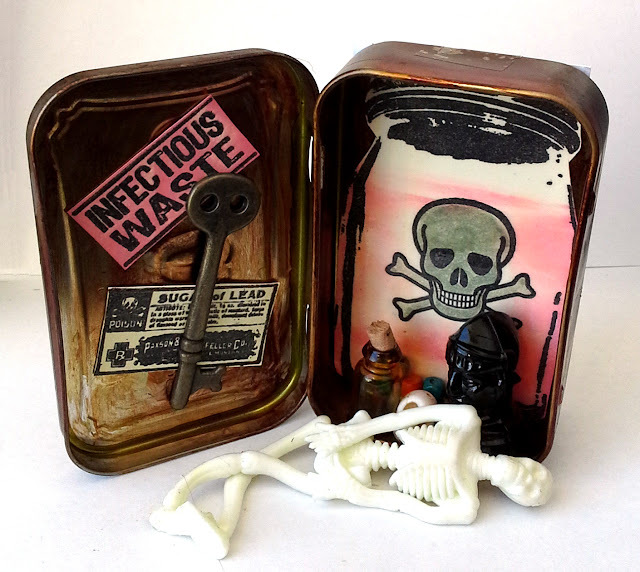 This one is by Lyneen Jesse! 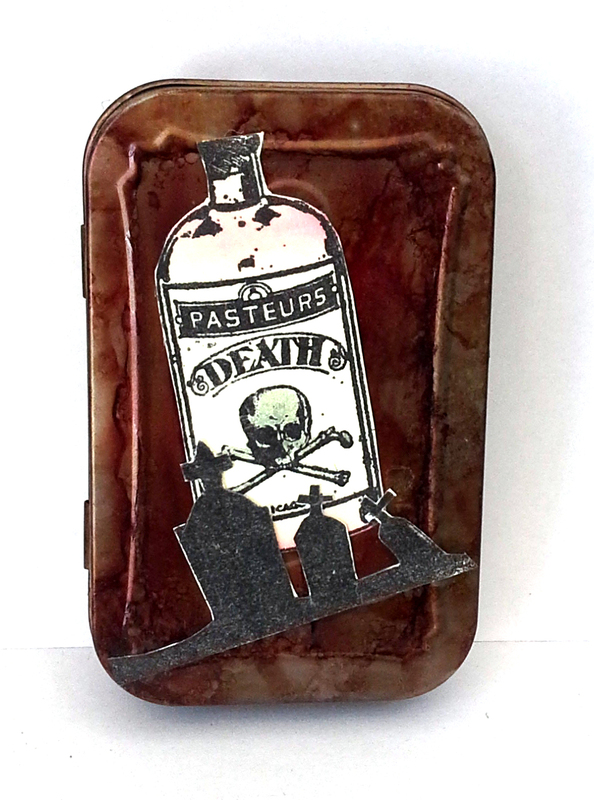 She's used Infectious Waste, Sugar of Lead, Mason Jar, Pasteurs Death, Cemetery, and Skull and Crossbones. 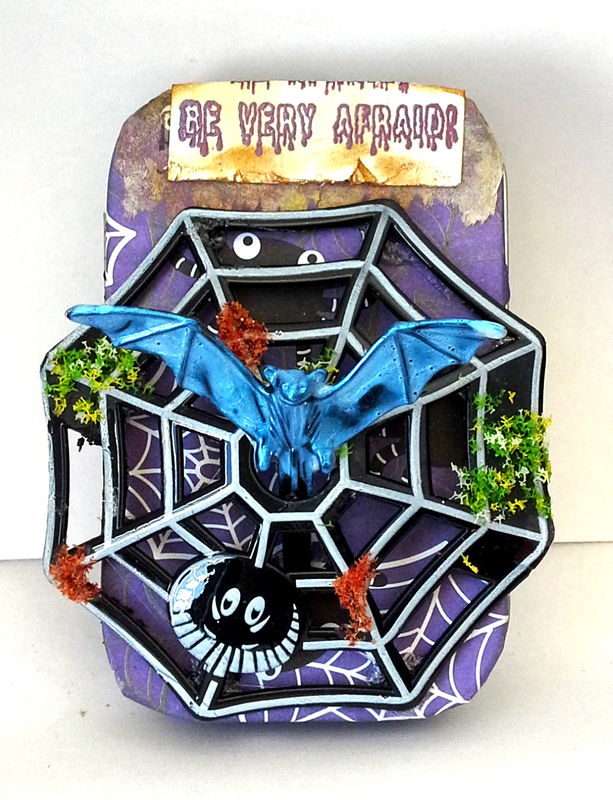 Mary Lozinak altered this spooky bit!! She's used If The Broom Fits, Are you a Good Witch, Spiked Fence, Row of Jack O Lanterns and Nosy Three. 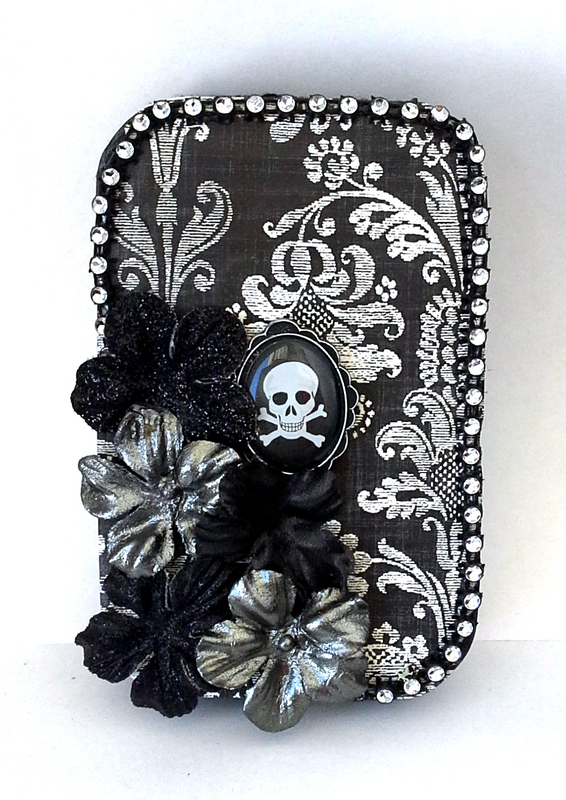 Marilyn Hughes has put together this deliciously glittery bit! 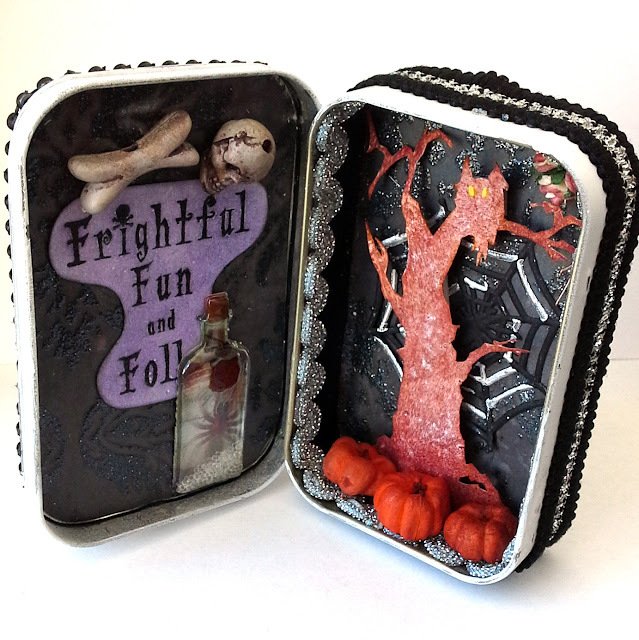 She's used Frightful Fun and Folly and Halloween Tree Silhouette. 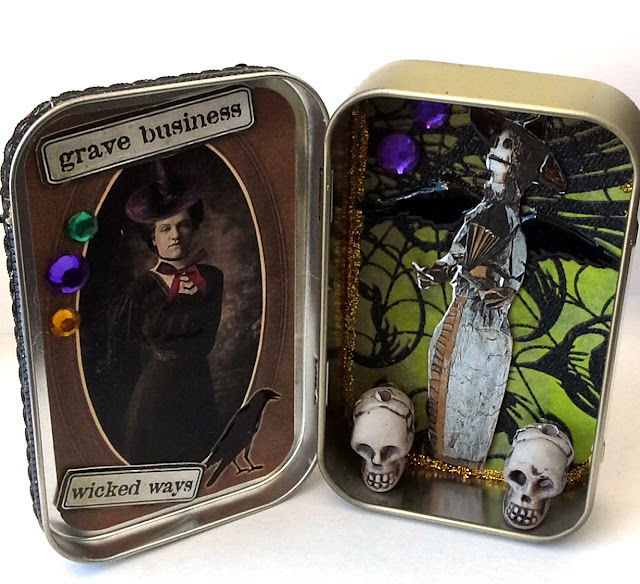 And last we have this little book covered tin by Michele Kosciolek! She utilized the Fly, Cemetery, Full Moon, All Hallow's Eve and Dictionary Page for her tin!! Leave these girls some love! Interested in being in our next swap?? We're currently taking SIGN UPS for a MAIL ART swap! Join our Facebook Group here, read the rules (pinned to the top,) and let us know if you'd like to sign up!! SHOOTERS: Shoot your mug in a Dark setting. 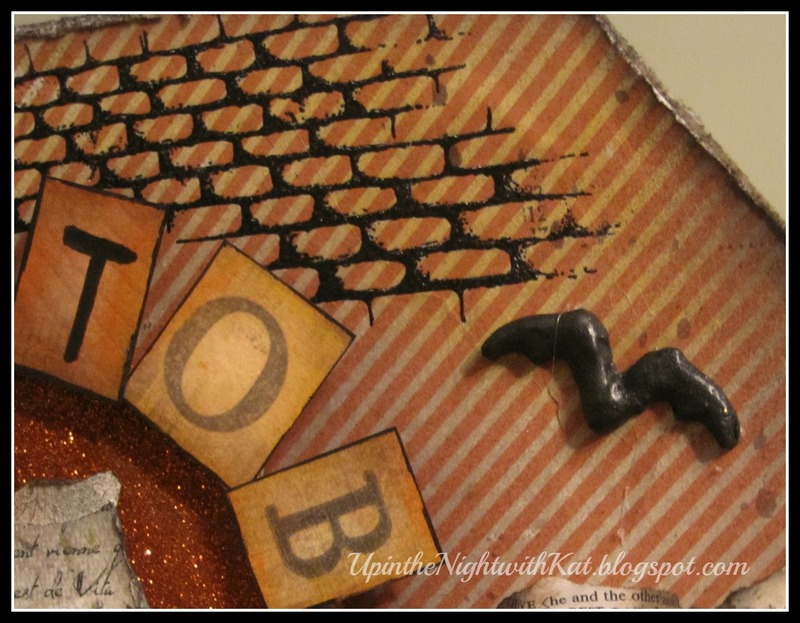 I hope you enjoyed my art journal spread and have a great day! 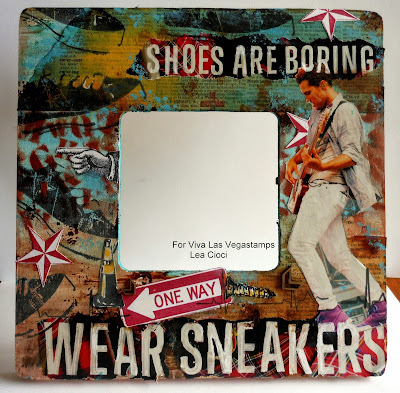 Welcome to a Winter Wonderland... October's 12 Tags of 2013 Viva Las VegaStamps! Style!!! 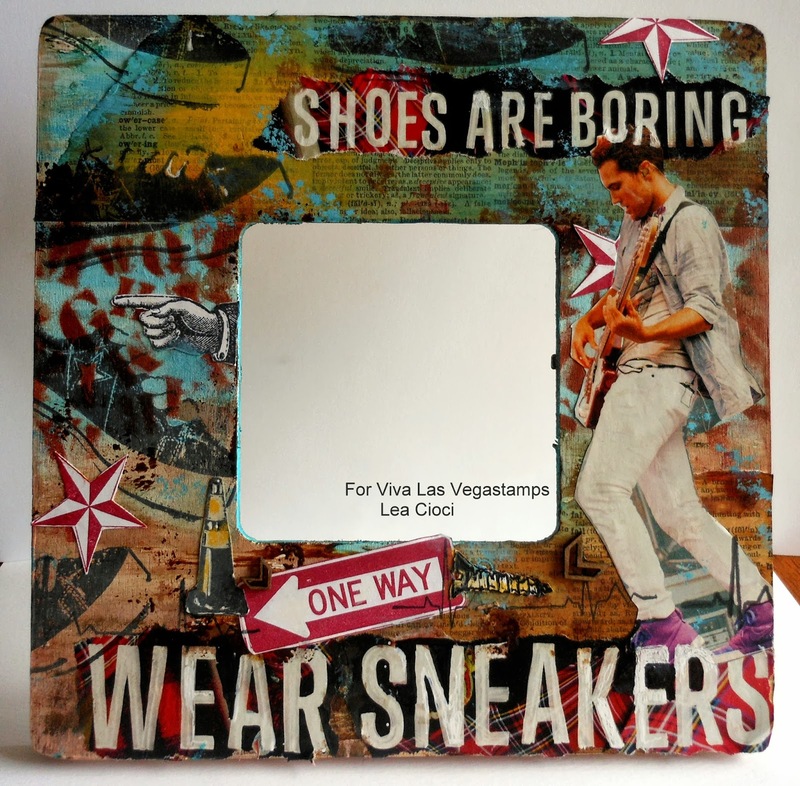 Welcome to Viva Las Vegastamps! 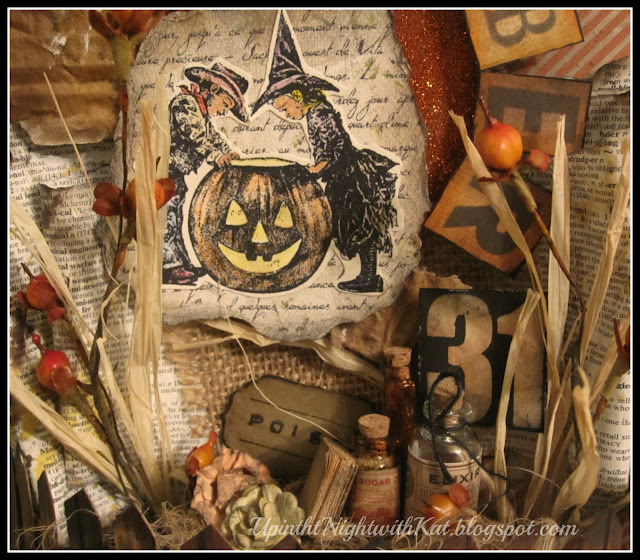 Susan here today to with my take on T!m Holtz' October installment of the 12 tags of 2013. I had to break the Halloween habit... and finally move on to the winter holidays. And since I am creating a winter version of this tag... 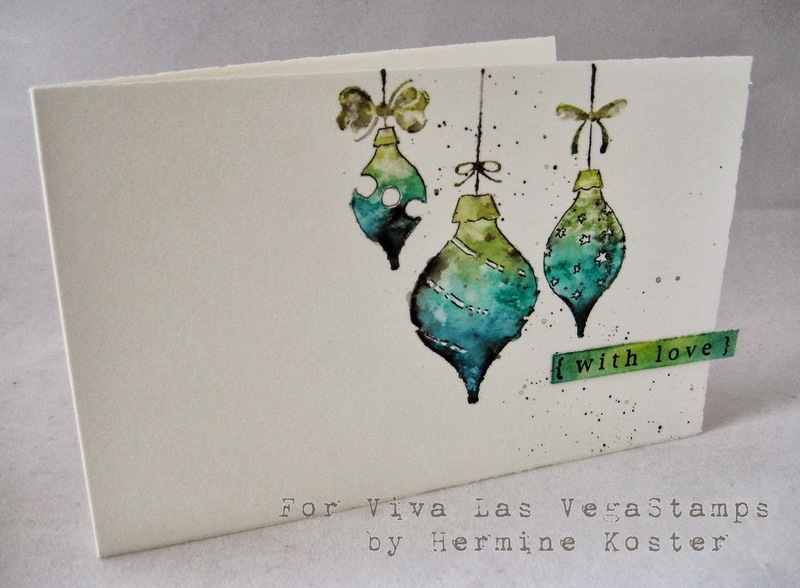 I also am adding a splattering technique to give the effect of snow falling for the Craft Stamper Take It, Make It Challenge #5. 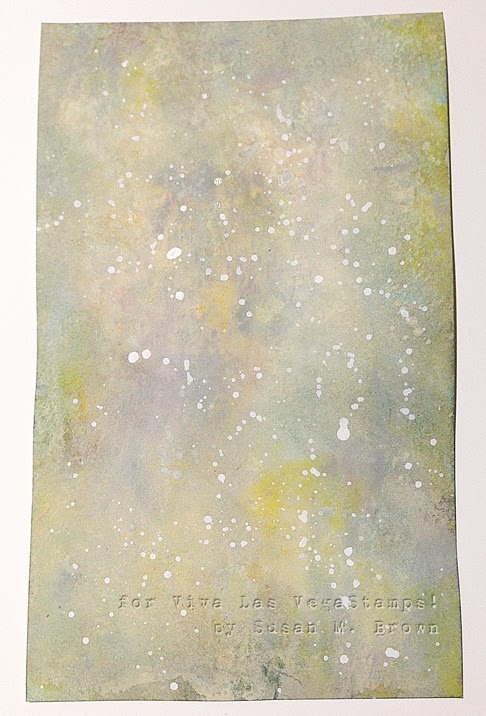 On a 4" x 6 1/2" section of off white cardstock, I created the marbelized background using Ranger Distress Paints (colors Weathered Wood, Crushed Olive, Dusty Concord and Antique Linen). 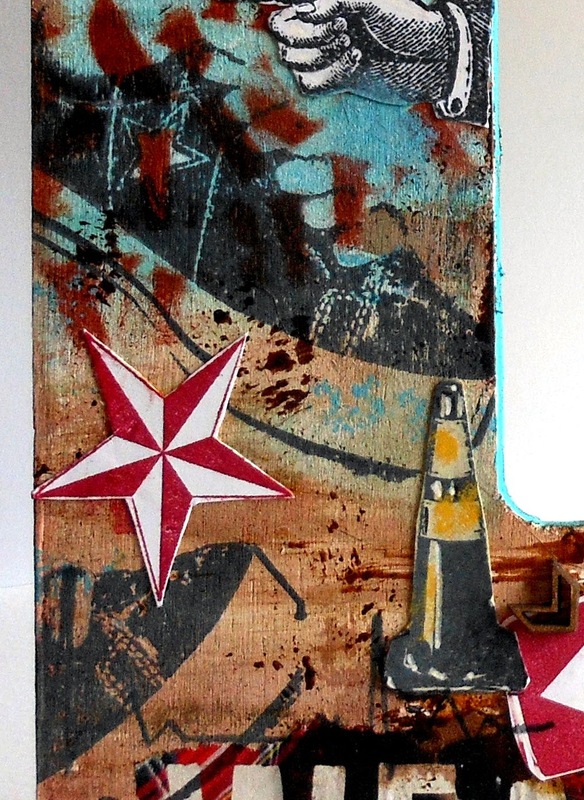 I applied a second layer of just Weathered Wood and Antique Linen to tone down the bright colors. I heat set to dry completely. 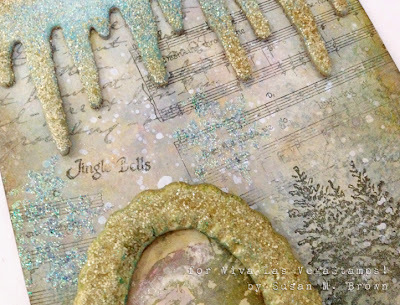 Using an ink blending tool I applied Broken China, Weathered Wood and Iced Spruce Distress Inks around the edges. I completed the background by splattering with a brush Picket Fence Distress Stain. I needed a frame for this month's tag technique and I don't have one for this purpose... BUT... I do have a lacy oval frame stamp (Doily #18849) that would be perfect. 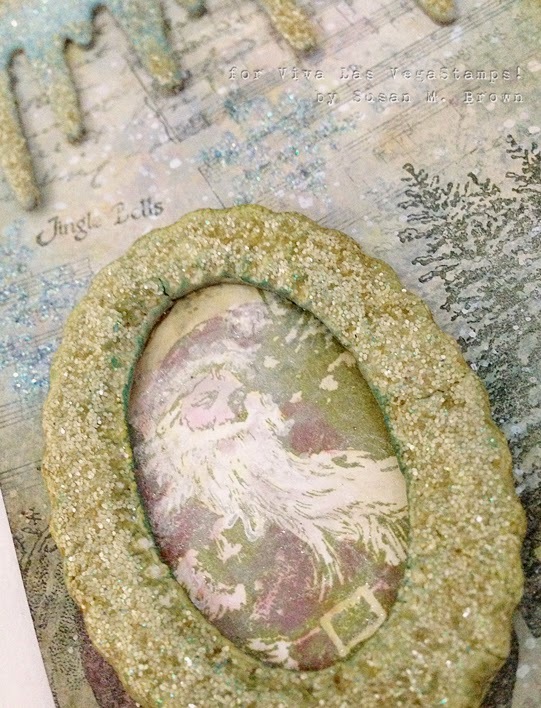 I could use Ranger Embossing Ink and a glue heat embossable powder to add the Distress Glitter... NAH! I want MORE DIMENSION. 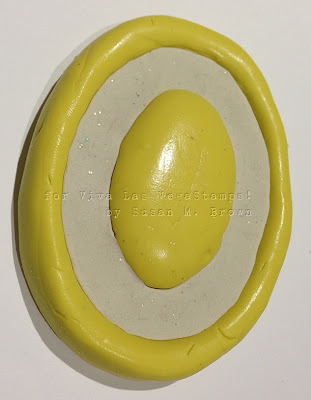 So I'm got out my Amazing Mold Putty and made a border mold of my stamp. 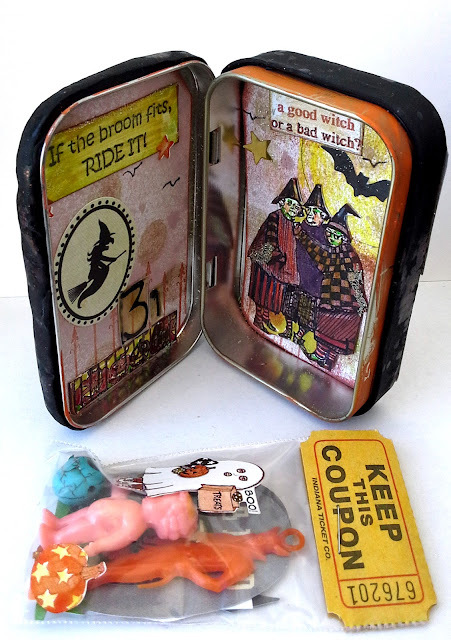 **WARNING** You need to thoroughly cover your stamp with petroleum jelly to protect your stamp - the rubber of the stamps and Amazing Mold Putty touching are reactive with each other. 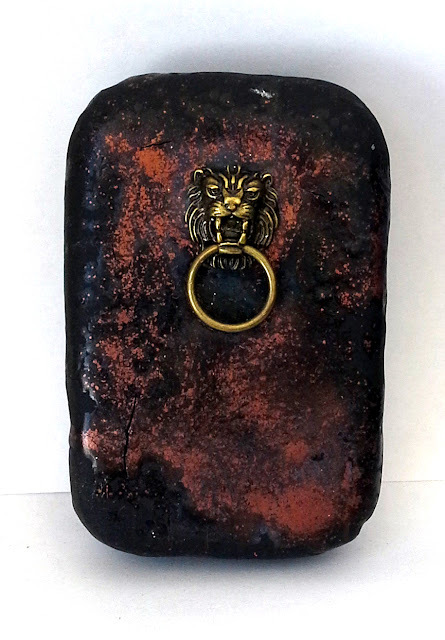 Watch closely and limit the time of stamp in contact with mold putty and remove it as soon as curing is completed. As you can see here with stamp removed from mold. Some of the Amazing Mold Putty has stuck to stamp, which I cleaned off with soap and water immediately so the detail of my stamp is not clogged up and to stop any reaction the two compounds may have. 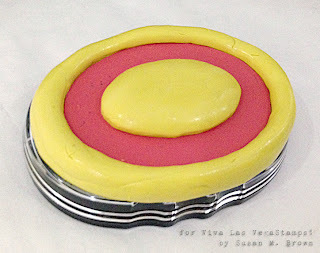 Now with a mold of my decorative border stamp - I filled it with Creative Paperclay® and let it cure. 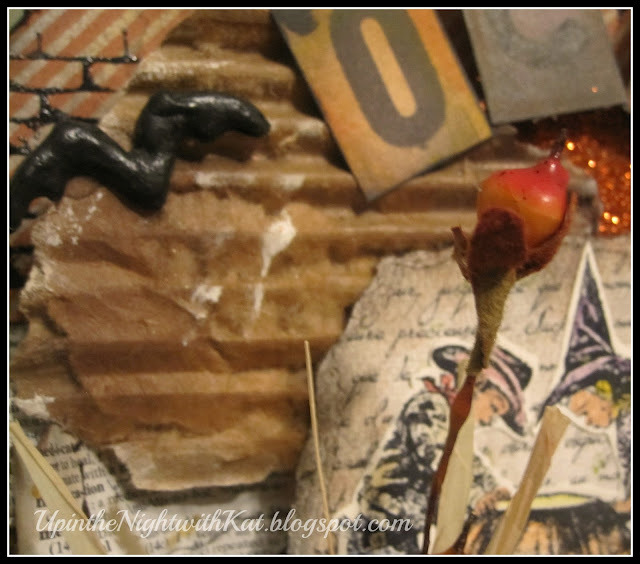 When paperclay is dried I inked and covered with Ranger Embossing Ink and heat embossable glue powder; then dredged in Antique Linen Distress Glitter. I went back with Vintage Photo and Broken China Distress Inks to add some depth and color to the edges. I stamped several stamps (see list below) creating a collage scene using Weathered Wood Distress Ink and also Stone Grey Staz-On Ink. 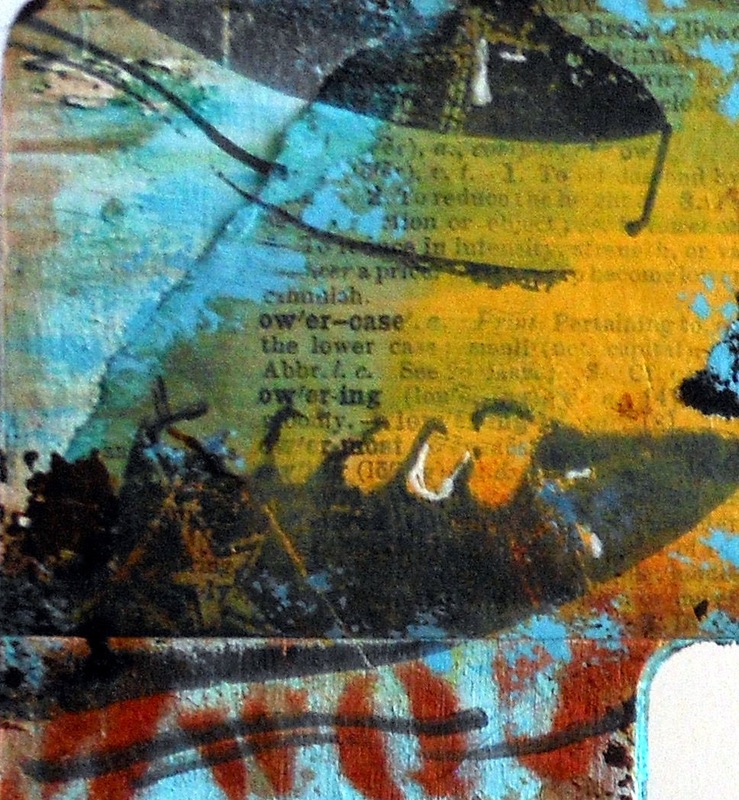 I really love how the Distress Ink just fades into the painted background giving subtle depth. I stamped snowflakes (see list below) with the embossing ink and applied the heat embossable glue powder; then applied a blue iridescent glitter to give the snowflakes shimmer. 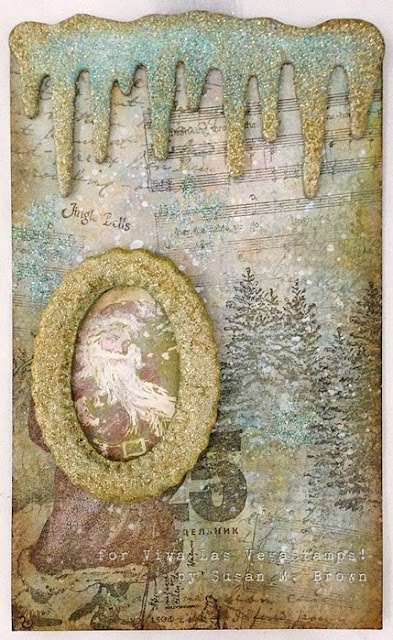 The finishing touch was a Tattered Angels vintage icicle chipboard embellished with Distress Inks and a combination of blue iridescent and Antique Linen Distress Glitter. I accented Santa Collage #18933 with a little color using water brush and Ranger Distress Markers. Because of warping and to give the tag some stability to support the frame and icicles, I mounted the tag to chipboard with a section of Miracle Sheet cut to size and I embedded a sheer organza ribbon to act as a hanger from the top. Viva Las VegaStamps used: Small Snowflake #18945; Medium Snowflake #18947; Large Snowflake #18946; Jingle Bells 10686; Early in Morning Swahili Script #1692; Christmas Trees Large #18942; Christmas Trees Small #18941; Santa Collage #18933; and Doily #18849 (oval lace border used to create mold). Supplies used: Cardstock; Stone Grey Staz-On Ink; various Ranger Distress inks and Picket Fence Distress Stain; Ranger Embossing Ink; various Ranger Distress Paints; Miracle Tape, Diamond Glaze Dimensional adhesive; Creative Paperclay®; Amazing Mold Putty; Antique Linen Distress Glitter; Iridescent Blue Glitter; Ranger Distress Markers; and Heat Embossable Glue Powder. Thanks so much for dropping by. 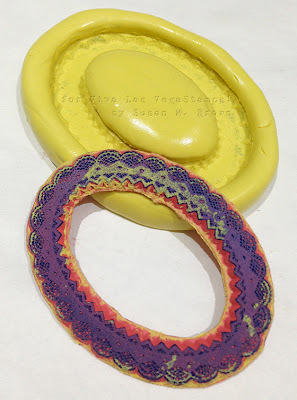 Have you entered the monthly challenge - you have two (2) days left to make a creation using the inspiration and your stash of VLVS! stamps... you could win more RUBBER! CLICK HERE for challenge details. 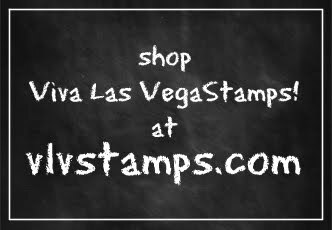 Also, you definitely want to subscribe to the blog feed and to the Viva Las VegaStamps! newsletter to be IN THE KNOW of everything going on at the Viva Las Vegastamps! store. 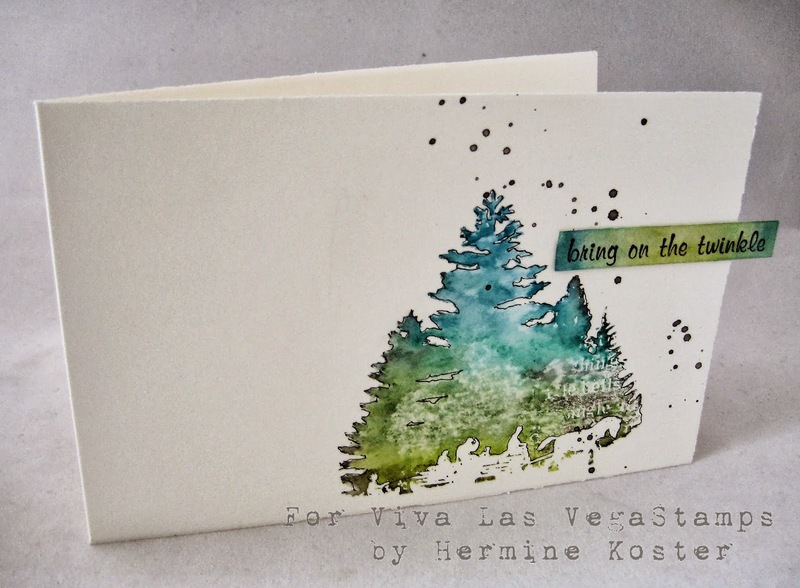 There's so much amazing inky inspiration to see! Hi Hermine here! I made this tutorial due to a card that I made for a challenge and people wanted to know how I did it. This is so easy, awesome and fun to do. THE way to make your Christmas cards for instance, its looks great and because one has to make a lot of them its a good thing that it is so easy and fun to make. This is the end result of my tutorial, below you find a step-by-step of how I did this. 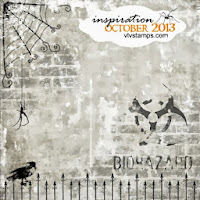 Take different colours of Lyra aquacolor and scribble on your stamp. 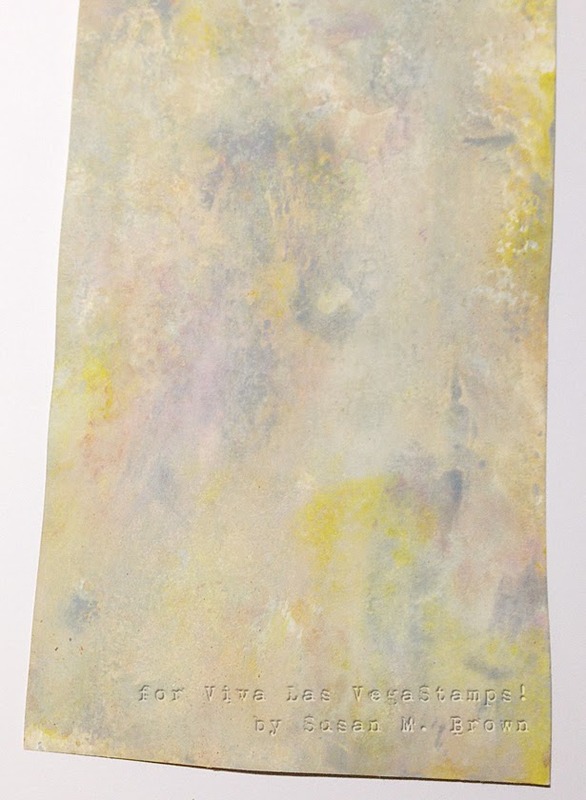 Stamp on paper and let dry, I prefer to let it dry by air, but you can dry it with a heattool. Take a Sukura of America micron 005 pen and outline the stamp. This is a close-up after I outlined it. Take a water brush and take some colour directly from your crayon. Splatter this on the right hand side of the card. Take a scrap piece of paper and stamp the tekst on it, colour this with a water brush and the same colours of the Lyra crayons you used for the main image. Glue in place. Another sample I made with the same technique and same colours, only different stamps. image and adhered it above the lid. 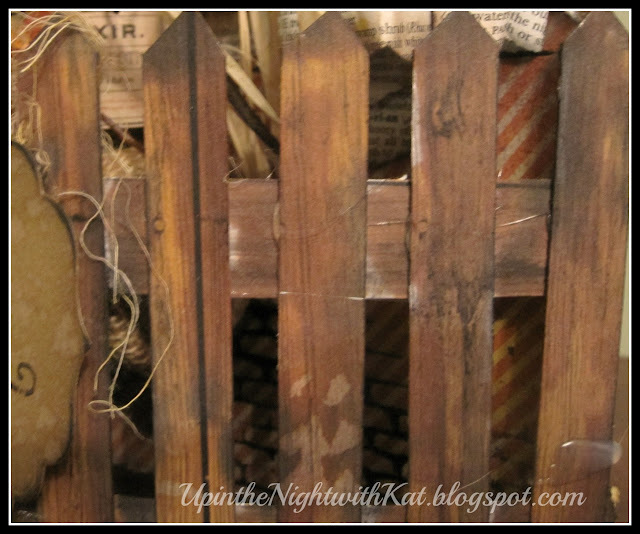 I used some wood paper and made my fence. 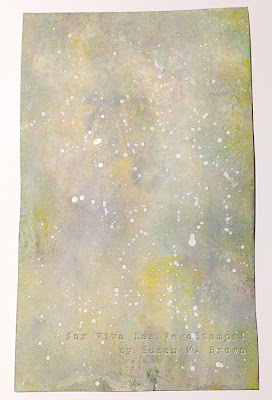 But since I didn't like the color, I used Sandal and Latte alcohol inks and changed the color. Once it was dry, I adhered it on each side of the tag so it would bow out. I fussy cut "O-C-T-O-B-E-R" from the block letters and used my geltos on them to help them match my tag a bit better. Using a glue gun, I adhered the letters to the outside edge of my lid. I also glued bats in three (3) places. Using a burlap-wrapped toilet paper roll, I placed it behind my fence to use it like a table. 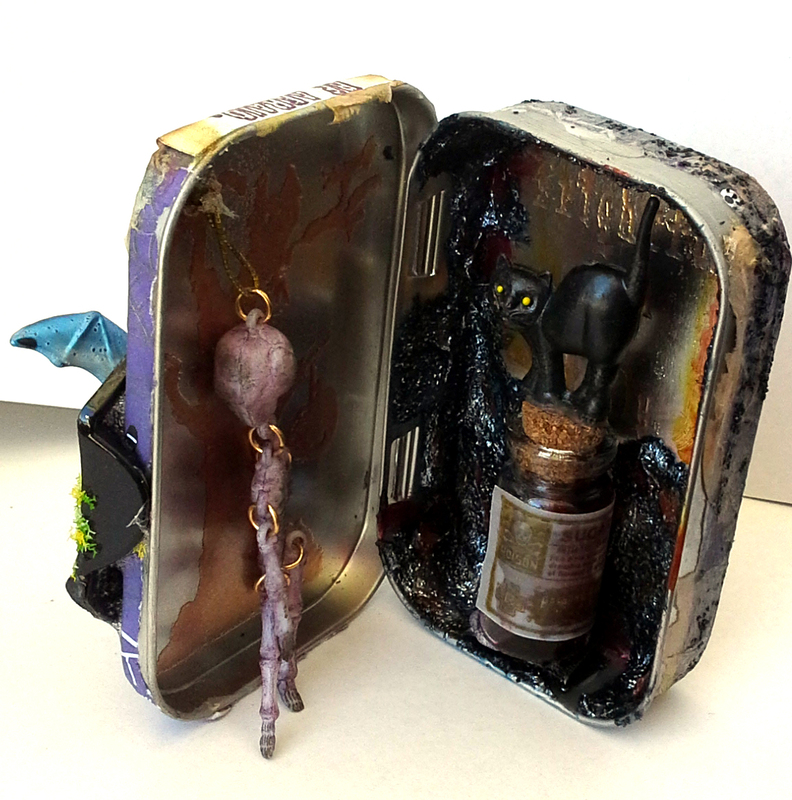 I adhered several small bottles and added some fake grass and flowers. I also sprayed some cheesecloth . 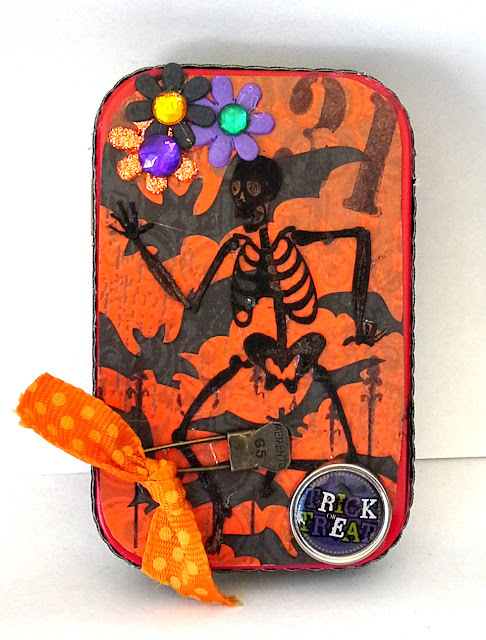 . . then added that and a small book & tag from UmWowStudio Oct. 2012 kit. Added a few more drops of spray and I was done. Thanks so much for stopping by today. 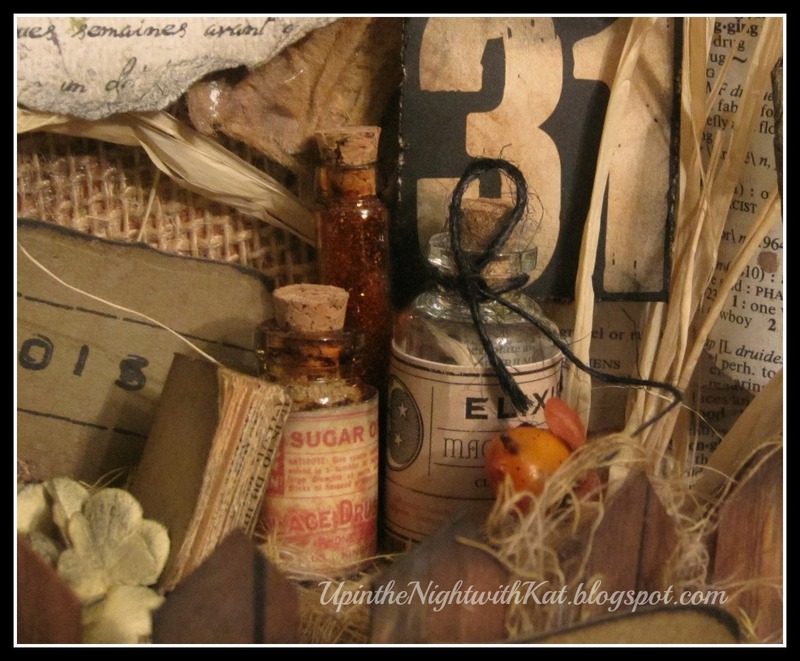 If you want to know how you can win a $20 gift certificate from VLVS from ME, visit my blog "UpintheNightwithKat.blogspot.com" for details. Thanks again!!! They say that women LOVE to collect shoes! 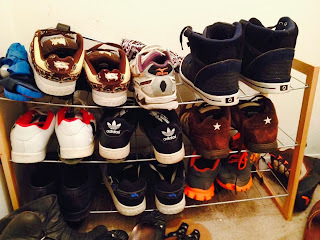 But did you know that a lot of men LOVE to collect sneakers!! I found these words, and found it a great creative resource for designing a wood frame. This is my soon to be son-in-law's rack of sneakers! Sure some maybe for sports, but most are for styling. The wood frame used was inexpensive, as such, there were a lot of rough edges. Use a fine grit sand paper to sand the wood the way you like it. For this project, a lot of texture was left to show through the wood. Gesso is painted on the frame as a base coat. This seals the wood so you do not waste a lot of your expensive paint. One coat was used, again because the texture was wanted. Normally, 2-3 coats works well. 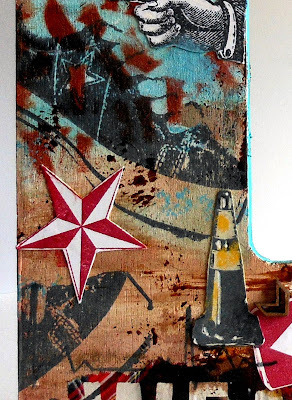 Paint, stain, stenciling, and collage techniques before stamping. 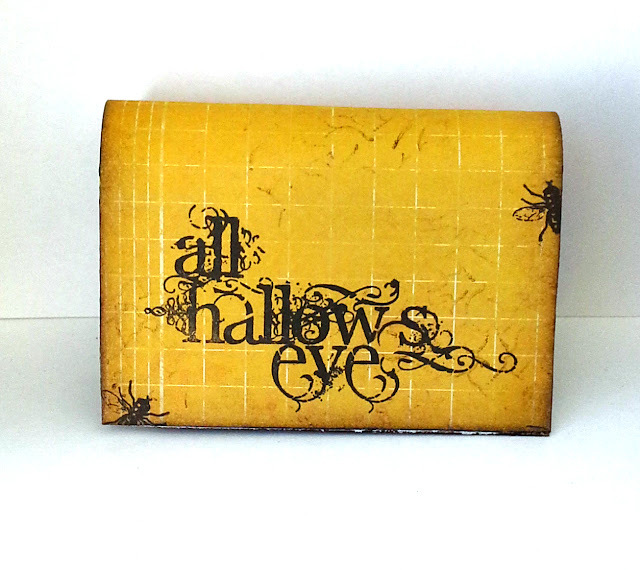 Some stamp images are stamped right to the wood, and others are stamped, cut and layered on wood. Further paint, and accenting with Gel Pens, Paint, stain added. UmWow Chevrons added for dimension, texture and directional ques. Pulse Rate image is genius! Fits with the theme of music playing and adds so much to a collage!! Sneakers used to be boring, but now they are a part of stylish fashion!!!! 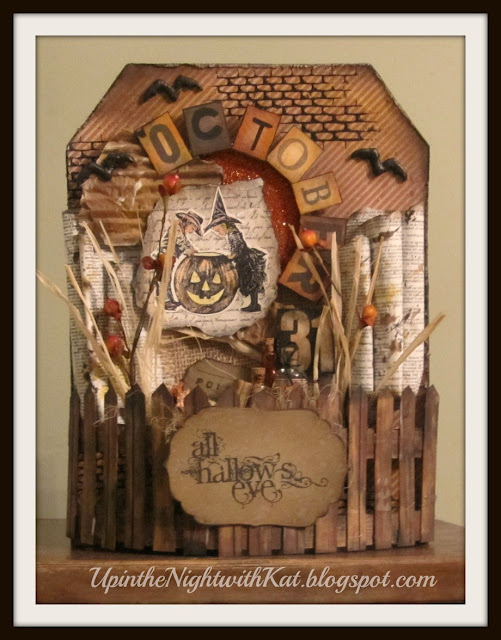 October Guest Designer : Kathy Clayton!